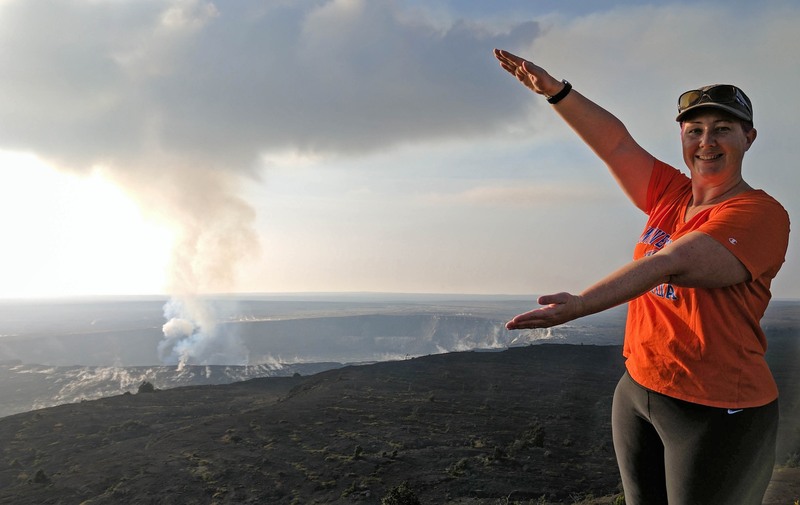 Lauren Huffman Kahre gives us a Gator chomp in front of the active lava lake of Kilauea in Hawaii. It’s not every day that we can catch one of our Gators on top of a volcano, in Hawaii! Meet Lauren Huffman Kahre, a UF Online student who has perfectly capitalized on the flexibility of her classes and traveled to Hawaii. Lauren studies Geology and decided to seek an adventure that would feed into her coursework. Because her classes are online, Lauren found a program with the University of Alaska and worked with her department at UF to make this untraditional educational experience a reality. During her semester in Hawaii, Lauren has hiked up volcanoes to survey lava flows for the Hawaii Volcano Observatory, information that the observatory uses to track the movement of the Hilina Fault System located on the south flank of Kilauea, Hawaii. Lauren’s work provides progress in the study and improvement of geologic hazard assessment in the region. Check here more information on the variety of degrees that UF Online offers and find out more about the #GatorsOnline Advantage.